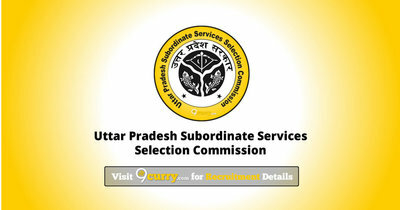 UPSSSC News / Updates 2019: Here are some of the very important updates and news regarding recruitment drives being conducted by UPSSSC - Uttar Pradesh Subordinate Services Selection Commission, Lucknow. The recent updated published related to the organization is - Yuva Vikas Dal Adhikari PET Exam Postponed 2019. UPSSSC Yuva Vikas Dal Adhikari PET Exam Postponed 2019: Uttar Pradesh Subordinate Services Selection Commission has announced that the Yuva Vikas Dal Adhikari PET exam is now postponed until further notice. UPSSSC Junior Assistant (Backlog) 2017 Exam Date 2019: Uttar Pradesh Subordinate Services Selection Commission, Lucknow has announced the News on 04 Feb 2019 for the exam . UPSSSC Tubewell Operator Exam Date 2018: Uttar Pradesh Subordinate Services Selection Commission, Lucknow has announced Date for Exam of Tubewell Operator will be held on 12 Jan 2019. UPSSSC VDO Gram Vikas Adhikari Exam Date 2018: Uttar Pradesh Subordinate Services Selection Commission, Lucknow has announced Date of VDO Gram Vikas Adhikari Exam 2018. UPSSSC Forest / Assembly Guard 2016 Exam Date 2018: Uttar Pradesh Subordinate Services Selection Commission, Lucknow has announced Date of Exam 2018. UPSSSC Yuva Vikas Adhikari Exam Date, Syllabus 2018: Uttar Pradesh Subordinate Services Selection Commission, Lucknow announce the date of 694 Excercise Trainer, Vikas Dal Adhikari Posts Exam Date, Syllabus and Examination to be held on 16 Sep 2018.